Combine your favs with this Bruschetta Chicken Pasta. 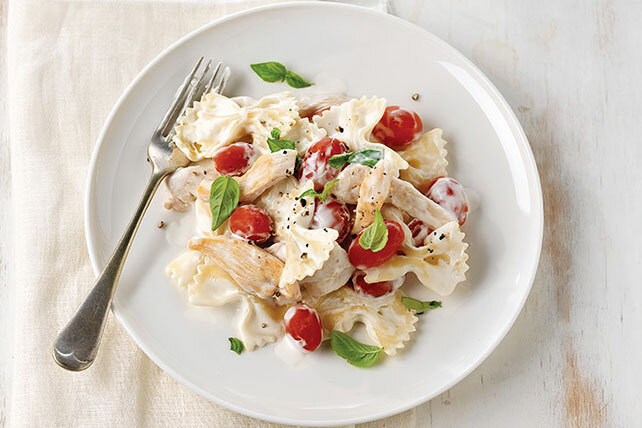 Bruschetta topping, chicken & cream cheese are tossed together for this Bruschetta Chicken Pasta. Mix cream cheese, milk and garlic powder until blended. Cook and stir chicken in large nonstick skillet on medium heat 5 to 6 min. or until done. Stir in broth; cook 3 min., stirring frequently. Add tomatoes and cream cheese mixture; cook and stir 3 min. or until heated through. Add pasta to chicken mixture; toss to evenly coat. Top with basil. Substitute 1 lb. uncooked peeled deveined medium shrimp for the chicken. Prepare as directed, reducing the initial cooking time to 2 to 3 min. or until the shrimp turn pink. Omit broth. Substitute 1 large tomato, chopped, for the grape tomatoes.